Satisfy your inner culture vulture at Dalai Lama Temple Complex and Bhagsunath Temple. Explore the numerous day-trip ideas around Dharamsala: Kangra (Mata Brajeshwari Devi & Kangra Fort). There's much more to do: indulge in some personalized pampering at some of the best spas, take in the spiritual surroundings of Jawalamukhi Devi Temple, take in the awesome beauty at Triund Hill, and explore and take pictures at Norbulingka Institute. To find other places to visit, photos, where to stay, and other tourist information, go to the Dharamsala trip planner . New Delhi to Dharamsala is an approximately 3-hour flight. You can also drive; or take a bus. Finish your sightseeing early on the 23rd (Thu) so you can drive to Shimla. Do some cultural sightseeing at Jakhu Temple and Army Herritage Museum. 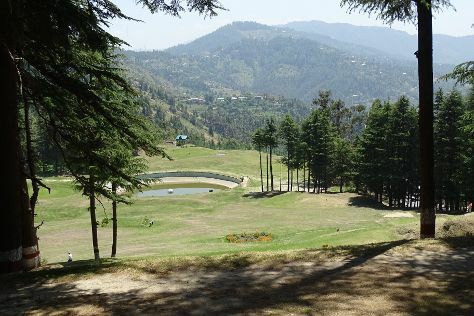 Change things up with a short trip to Naldehra Golf Course in Naldehra (about 52 minutes away). And it doesn't end there: don't miss a visit to The Mall, take in the architecture and atmosphere at Christ Church, explore and take pictures at Gaiety Heritage Cultural Complex, and admire the landmark architecture of Viceregal Lodge. To see photos, traveler tips, other places to visit, and tourist information, read Shimla day trip planning site . Traveling by car from Dharamsala to Shimla takes 5 hours. Alternatively, you can take a bus. Cap off your sightseeing on the 26th (Sun) early enough to go by car to Sangla. Close to the Tibetan border, Sangla is a small town rarely visited by foreign tourists. Start off your visit on the 27th (Mon): contemplate in the serene atmosphere at Kailash Dwar Sangla, then explore the ancient world of Kamru Fort, then explore the activities along Baspa River, and finally wander the streets of Rakcham. For ratings and more tourist information, use the Sangla online trip itinerary planner . Drive from Shimla to Sangla in 7 hours. Finish up your sightseeing early on the 27th (Mon) so you can go by car to Kaza. Kaza, is the sub-divisional headquarter of Spiti Valley in the district of Lahaul & Spiti in Himachal Pradesh. Its located at 3600 ASL and is a cold desert. On the 28th (Tue), contemplate in the serene atmosphere at Komic Monastery, admire the striking features of Sakya Tangyud Monastery, then wander the streets of Hikkim, and finally admire the verdant scenery at Spiti Valley. To find more things to do, ratings, maps, and other tourist information, use the Kaza tour itinerary app . Getting from Sangla to Kaza by car takes about 6.5 hours. Finish up your sightseeing early on the 28th (Tue) so you can go by car to Manali. Get some cultural insight at Hidimba Devi Temple and Manu Temple. Change things up with a short trip to Naggar Castle in Naggar (about 1h 10 min away). Next up on the itinerary: relax and rejuvenate at some of the best spas, admire the verdant scenery at Solang Valley, examine the collection at Museum of Himachal Culture & Folk Art, and scramble along the landscape with a canyoning and rapelling tour. To see reviews, traveler tips, and more tourist information, refer to the Manali day trip tool . Traveling by car from Kaza to Manali takes 5 hours. Finish your sightseeing early on the 1st (Sat) so you can travel back home.